March 2nd will mark the one-year anniversary of the Nashville Predators trading David Legwand to the Detroit Red Wings. 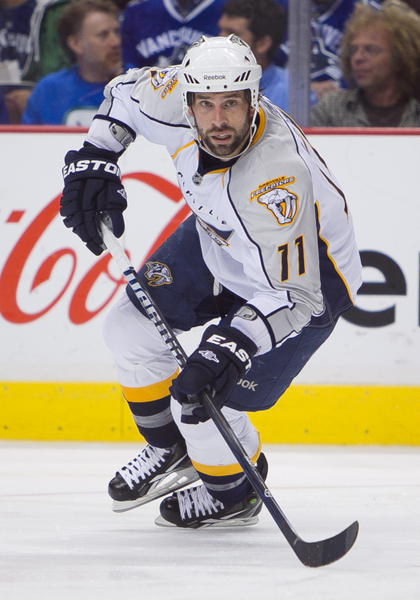 Last year, the Nashville Predators were out of playoff contention and willing to part ways with veteran center David Legwand. This year, the Predators stand in first place and are the current favorites for the Presidents’ Trophy. On March 2nd, the Predators shipped Legwand to the Detroit Red Wings for Patrick Eaves, prospect Calle Järnkrok and a conditional 2014 pick (mentioned later). In his 15-year career with Nashville, Legwand became the franchise’s all-time leader in goals (210), assists (356), points (566) and games played (956). Originally in the market for a defenseman, Red Wings GM Ken Holland received news that center Pavel Datsyuk would be sidelined with a knee injury for a minimum of three weeks; within hours, Holland announced the trade to bring in Legwand. It’s no secret that Legwand was brought in for one job, to help stretch the Red Wings 22-year playoff streak to 23. In 21 regular season games with Detroit, Legwand recorded 11 points (4G, 7A) to go along with a -9 rating. In five playoff games, he was a -1 with zero points and only four SOG. The Wings bowed out to Boston in just five games. On July 4, 2014, Detroit officially parted ways with Legwand, who signed a two-year, $6 million contract with the Ottawa Senators, a price that both Nashville and Detroit likely would have never offered. The Senators, having just traded star center Jason Spezza to the Dallas Stars, brought in a veteran center to fill the lineup. This season, as a member of the Senators, Legwand has played 55 games and recorded 22 points (8 G, 14 A) while averaging a career-worst 14:23 of ice time. Legwand has also been a healthy scratch for two games and his name has surfaced in the rumor mill again this season. Considered one of the Wings’ top prospects at the time, Järnkrok—who was taken in the second round, 51st overall—was never given a chance to play at the NHL level, even through all of Detroit’s injuries last season. However, being the heart of the deal for Nashville, the 23-year-old Swede was given immediate time to prove himself. In 12 games with the Predator’s last season, he posted nine points (2 G, 7 A) to go along with a +7 rating. Most notably for Nashville, Järnkrok did not look out of place at a higher level. This season, Järnkrok has played in 56 of Nashville’s 61 games tallying 15 points (6 G, 9 A) with a +6 rating as the third-line center. Eaves played 197 games through five seasons with Detroit, recording 56 points (29 G, 27 A). While he wasn’t the most effective scorer, Eaves had an incredible wrist shot and was a solid depth player who killed penalties. And who can forget this moment, which starts off with Mickey Redmond talking about Eaves’ shooting ability. Prior to the 2014-15 season, Eaves signed a one-year, $650,000 contract with the Dallas Stars; playing for his fifth NHL club. Eaves has only managed 28 games and 13 points (6 G, 7 A) in Dallas, having been hindered by injuries to his ankle and a recent concussion suffered from being hit in the face by a slap shot from teammate and potential Calder-nominee John Klingberg. After seeing time on the top line next to star forwards Tyler Seguin and Jamie Benn, Eaves may never fulfill the expectations that come from being the 29th overall pick (2003). Set to be a free agent at the end of the season, Eaves playing days in the NHL may be limited. When Detroit qualified for the playoffs on April 9th, 2014, the conditional pick traded to Nashville became a second-rounder (third-rounder had they missed the playoffs). The pick (46th overall), was traded to the San Jose Sharks on June 28th in exchange for the Sharks’ second-round pick (51st overall) and fourth-round pick in 2015 (TBD). The pick was used to take Swedish defenseman Julius Bergman, who currently plays for the London Knights of the OHL. In his rookie season with the Knights, Bergman has played in 50 games, recording 34 points (10 G, 24 A) and a -1 rating. Bergman is the Knights’ highest scoring defenseman this season.